Replaces Epson 27XL Alarm Clock Cartridges. High Capacity Compatible Epson T2711XL Black ink Cartridge. Compatible Epson T2714XL Yellow Ink Cartridge. The Epson Workforce WF-7110 DTW is a colour printer that is best suited to fulfil the office needs. It is capable of producing high quality text documents at a very less cost. It can produce results in a very less time due to its great printing speed. The Epson Workforce WF-7110 DTW is quite heavy and weighs 14.9 kg. It is 567 mm wide, 304 mm tall and 424 mm deep. There are two paper loading trays at the front, each having a capacity of 250 sheets. There is another paper loading tray at the back for thick media. The 5.5 cm LCD screen along with some controls is used to control the printer. It can produce 18 pages per minute in case of monochrome printing and 10 pages per minute in case of colour printing. The Epson WorkForce WF-7110 DTW Ink Cartridges have a maximum monthly duty cycle of 20,000 pages. USB, Ethernet and Wi-Fi are the main interfaces through which the printer can be connected. This printer has a printing resolution of 600 x 600 dpi. The Epson Workforce WF-7110 DTW is a colour printer that gives a high quality output at very less cost. It has excellent connectivity options but the paper handling capacity cannot be expanded further. Also it cannot produce high quality photographs as it has a limited resolution. Q. Do Epson WorkForce WF-7110DTW printer support wireless printing? A. 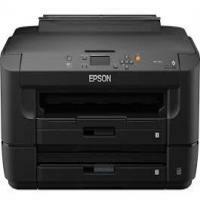 Yes, you can wirelessly print with Epson WorkForce WF-7110DTW printers via your phone/tablet or your computer. Make sure to be connected to the same Wi-Fi network as your printer. Q. How many pages can your compatible Epson WorkForce WF-7110DTW ink cartridges print? A. Our compatible Epson T27XL ink cartridges can print up to 1,100 pages with all colours. We also provide compatible Epson T27XXL black ink cartridges which can print up to 2,200 pages without having to be replaced. Q. I need a heavy duty printer with high page yield that can directly print from mobile devices. Is the Epson WorkForce WF-7110DTW suitable for my needs? A. Absolutely, this printer is perfect for you! Epson WorkForce WF-7110DTW printers have a monthly duty cycle of 20,000 pages. Epson WorkForce WF-7110DTW ink cartridges are high yielding ink cartridges that can print up to 1,100 pages. This printer also enables mobile printing and has an automatic duplexer, which saves time as it allows two - sided printing. Q. What are the dimensions of this printer? A. The Epson WorkForce WF-7110DTW printer is quite heavy and weighs around 14.9kg. The printer measures about 567 mm in width, 304 mm in height and 424 mm in depth. Q. What types of paper can I use with Epson WorkForce WF-7110DTW printers? A. Legal paper, user defined paper, 16:9, 13 x 18 cm, 10 x 15 cm, 9 x 13 cm, letter paper, envelopes(No. 10, DL, C6 C4), B5 size, B4 size, A6 size, A5 size, A4 size, A3 size and A3+ size paper can be used with Epson WorkForce WF-7110DTW. A. You need to use the CD-ROM that came with your device. If you no longer have the CD-ROM, visit http://support.epson.net/setupnavi/ to install the drivers. Q. I recently ordered Epson WorkForce WF-7110DTW ink cartridges for my printer. The colour printouts are fine, but black printouts seem faded. A. We are sorry to hear this. Please check if the ink cartridge is inserted into the printer properly. If you’re still facing a problem with the cartridge, please contact 048 308332211 or email us on info@printerinkcartridges.ie and we will be happy to help.